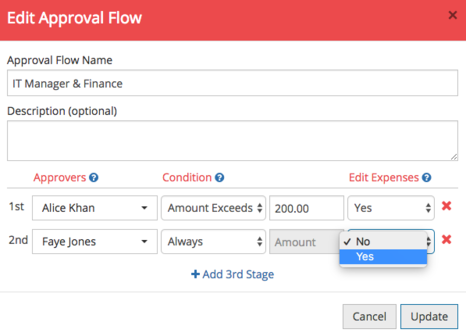 Add, edit or delete an approval flow stage. 1. Navigate to Admin and click Approval Flows. Select a new approver by deselecting the current approver by clicking their name and selecting a new name from the list. You can select multiple approvers from the drop down list by selecting their names. 2. Select the Approvers Name(s) from the drop down. 3. Select the Condition that they approve under from: Always, Amount Exceeds, Amount Under or Outside Policy. 4. Enter an amount if you selected Amount Exceeds or Amount Under. 5. Select Yes if you would like your approvers to be able to Edit Expenses from Approval. 6. Click Update and all expenses under this approval flow submitted from this point will follow your changes. 1. Click Edit next to the Approval Flow. 2. Click the red X next to the stage you wish to delete. Any expenses currently at this stage will move to Approved in Finance.